SAVE YOUR TENDER NOSE FROM EMBARRASSING ODORS WITH GREAT VALUE SG BAMBOO CHARCOAL DEODORIZER At Great Value SG, we make quality products that are built to last so that you save money in the long run. Whether it's smoke odor, dog smell, dirty sneaker smell, musty basement mildew odor, toxic odors from new cars or hockey bags, our premium bamboo charcoal absorbs them all like a sponge and makes the air fresh again! We care for the environment and make products that are natural and eco-friendly so you can be sure that they are safe to use at home for you and your family. - Perfect for the fridge. More effective than Baking Soda - Prevent mold and mildew. Help keep food fresh longer - Removes bacteria and toxic chemicals from paint or furniture - A natural effective solution to remove odors and reduce your exposure to harmful chemicals - Enjoy better indoor air quality and healthy environment Start noticing improvements in the room or area after 1-2 days. You can reuse them over and over by placing them under the sun for 1 to 2 hours to "recharge" it monthly and reuse it for up to 2 years. One bag covers a small area of up to 70 square feet so BUY MORE BAGS TO COVER BIGGER AREA OR IF ODOR IS SEVERE. It comes with a FREE E-guide to help you maximise the use of your Bamboo Charcoal Bags. Enjoy the brand that 20,000 happy customers (and counting everyday) turned to for solutions to their smelly problems! Many love our products and went on to buy for their family and friends. We offer 30 DAYS 100% MONEY BACK GUARANTEE if you are not satisfied with our product. Order yours now and to enjoy better indoor air quality today! Consider buying another one for your best friend! Stocks are limited! So grab it while it's there as this offer will not last forever. SAVE YOUR TENDER NOSE! Be amazed by this incredibly effective product that works well in removing odors. Whatever the odors, our bamboo charcoal absorbs them all and makes your air fresh again! So no more worries for embarrassing smells or nauseating stinks. It's a perfect dehumidifier and odor eliminator. Each bag clears the air in a SMALL SPACE of up to 70 square feet. BUY MORE BAGS TO COVER BIGGER AREA OR IF ODOR IS SEVERE. Save More with PROMO CODE. SIMPLE DESIGN THAT LOOKS GREAT AND FITS IN WITH ANY FURNISHINGS: We've spent a lot of efforts and time (and enjoyed every moment) to bring you this simple and elegant solution to your smelly problems. Available in 5 stylish colors. Make great gifts for men or women! Portable and can be used in the house or office such as Kitchen, Refrigerators, Freezer, Closet, Luggage, Shoe cabinet, Kid's room, Pet Area, Gym bags and Auto Mobile. GET READY TO BECOME A RAVING FAN! Your satisfaction is guaranteed! We love our customers and we only provide you with the finest product and service around or your money back! 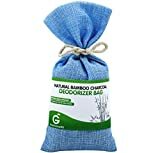 Add your Natural Bamboo Charcoal Deodorizer Bag to cart now and experience the Great Value SG customer service phenomenon!